It’s the second week of Series 5 in Forza Horizon 4 and that means Autumn has dawned across beautiful, historic Britain for the next seven days. 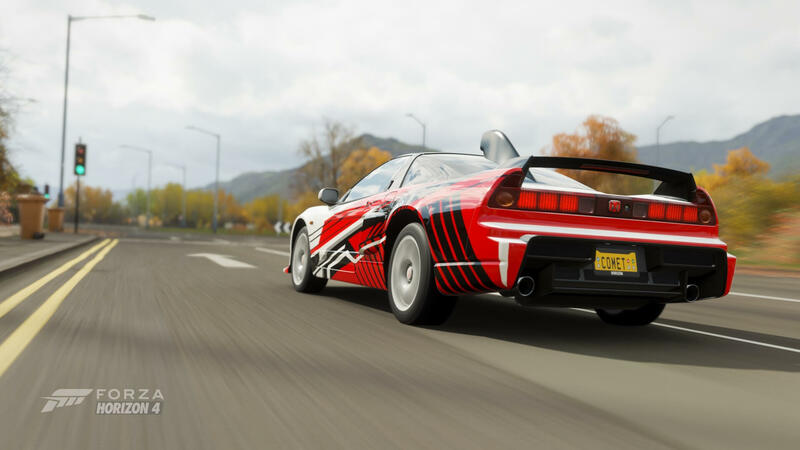 Not only is there new events and challenges to complete, but a selection of new rides has become available to Forza Horizon 4 Car Pass holders, including the 2005 Honda NSX-R GT – a returning fan-favourite race machine that hasn’t appeared in the Forza franchise since the first-ever Forza Horizon on Xbox 360. The first thing you’re certain to notice about the return of Autumn in Britain is all those brown leaves scattered across the road – which are ideal for blasting your favourite supercar through in a stylish manner! The overall landscape will have a more reddish tint to it as oranges and yellows dominate the colours of the trees. When combined with the spectacular lighting effects and visuals of Forza Horizon 4, it certainly makes those Autumn skies over Britain look spectacular. 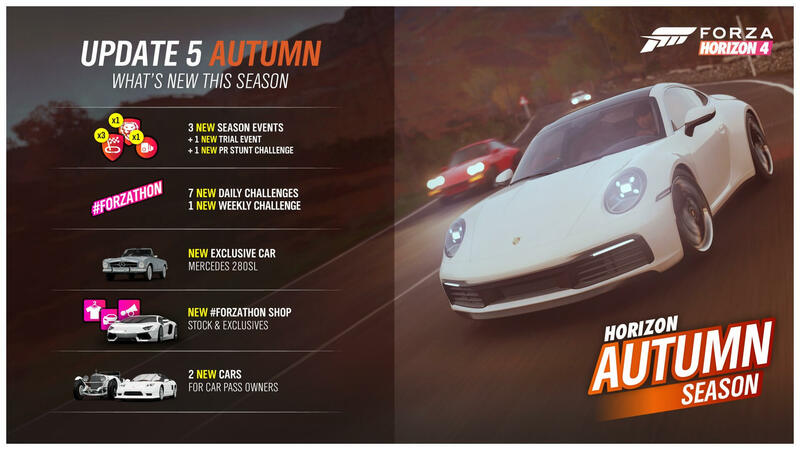 As a reminder, the seasonal change in Forza Horizon 4 occurs every Thursday at 2:30pm GMT. That’s 9:30am EST and 6:30am PST. Below, we’ll have a look at everything that’s new to discover this week in both beautiful, historic Britain and the Fortune Island expansion. 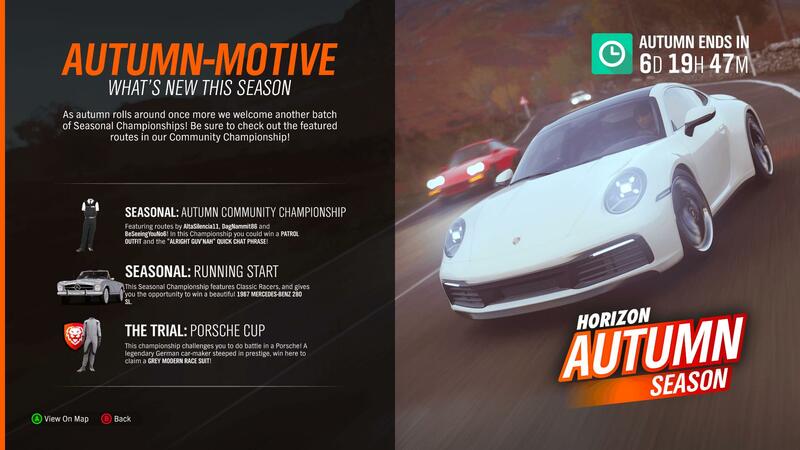 From new types of Seasonal Championships to unmissable new cars, this is your ultimate guide to everything new in Horizon Life this Autumn! 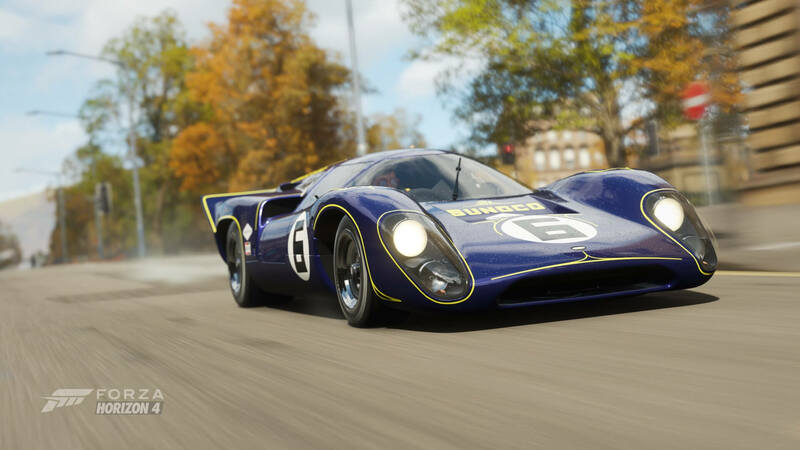 Following in the footsteps of last week’s Seasonal Championships, the slate of Autumn experiences in Forza Horizon 4 will have you enjoying a mixture of both community-created events and the usual line-up of curated festival races. First up is the ‘Autumn Community Championship,’ featuring a line-up of race events that have been made using the Route Creator. These events have been handpicked by developer Playground Games and offer the Patrol Outfit and the “Alright guv’nah” Quick Chat phrase. Meanwhile, the ‘Running Start’ Seasonal Championship in Edinburgh features classic race cars and gives you the opportunity to win a beautiful 1967 Mercedes-Benz 280 SL – the latest exclusive car to arrive into Forza Horizon 4. This week’s Trial event focuses entirely on Porsche and tasks you to get together with 5 other drivers to take on a team of Drivatars set to Unbeatable difficulty. Successfully beat the Trial and you’ll unlock the Grey Modern Race Suit, which follows last week’s Red Modern Race Suit from the Three Diamonds Seasonal Championship in Summer. Elsewhere, the ‘When the Grass is Jewelled’ Seasonal Championship will see you behind-the-wheel of classic sports cars to unlock bonus credits, wheelspins and the “Never tell me the Odds!” Quick Chat phrase. There’s also this week’s Seasonal PR Stunt, which shines the spotlight on the Derwent Reservoir Speed Trap with a designated target of 200mph. Beating the challenges offered by Seasonal PR Stunts will grant you a bonus Wheelspin or Super Wheelspin. In addition, there’s also a Seasonal PR Stunt at the Berm Speed Trap, which challenges you to drive through it at a speed equal to or greater than 140mph. Completing Fortune Island Seasonal Championships and PR Stunts will see you earn additional Wheelspins that can unlock a variety of unique items, including bonus credits, rare cars, vehicle horns and clothing. Fortune Island will continue to receive an assortment of dedicated Seasonal Championships and PR Stunts every Thursday to accompany the mainland season change and these will always remain exclusive to owners of the expansion. This week’s Forzathon event celebrates the legacy of Mitsubishi and their long-awaited return to Forza Horizon 4. You’ll be driving the iconic 1999 Mitsubishi Lancer Evolution VI GSR and tasked with earning a total of 12 stars from Speed Zones before enjoying 5 victories in Dirt Racing events, followed by a relaxing 10-mile drive across the beautiful British countryside. Complete the weekly Forzathon event and you’ll earn yourself 100 Forzathon Points – or double if you own the Forza Horizon 4 VIP Membership or the Lake Lodge home. 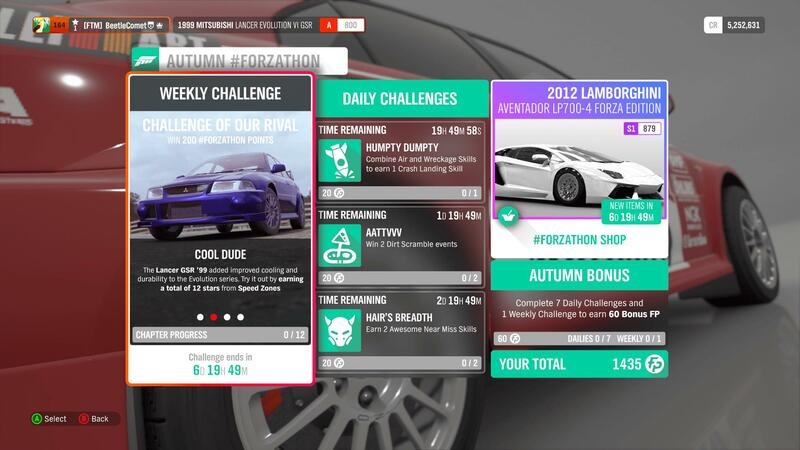 Weekly Forzathon events always centre around a specific car type, model or manufacturer, and allow you to try out the diverse roster of the more than 450 Forzavista cars available in the game. Additional Forzathon Points can be earned by completing daily challenges and participating in the shared Forzathon Live events, which occur every hour in the shared world. 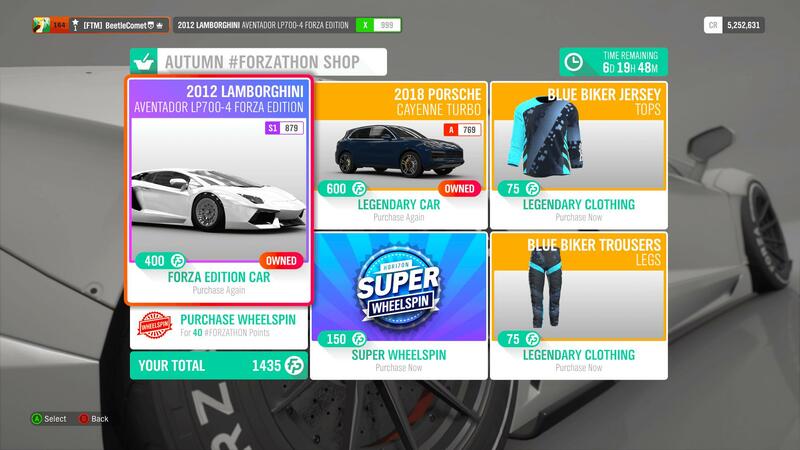 Forzathon Points can be spent in the Forzathon Shop, which offers a rotating stock of rare cars, clothing items and wheelspins. Every week, the Forzathon Shop replenishes its stock of exclusive cars and clothing items, and this week is no different. In terms of cars, we have the 2012 Lamborghini Aventador LP700-4 Forza Edition available to unlock for 400 Forzathon Points and the 2018 Porsche Cayenne Turbo priced at a costly 600 Forzathon Points. It’s worth noting both are exclusive cars and have been only previously available from the Auction House and Wheelspins. Meanwhile, there’s also the Blue Biker Jersey and Trousers should you desire to further personalize your character’s appearance. These latest additions are accompanied by the usual Wheelspin and Super Wheelspin offerings, should you wish to test your luck in the hopes of winning some exciting new wheels, clothes or credit bonuses in exchange for those elusive Forzathon Points. Forza Horizon 4 expands its offering of automobiles with the latest batch of rides available for Car Pass holders. 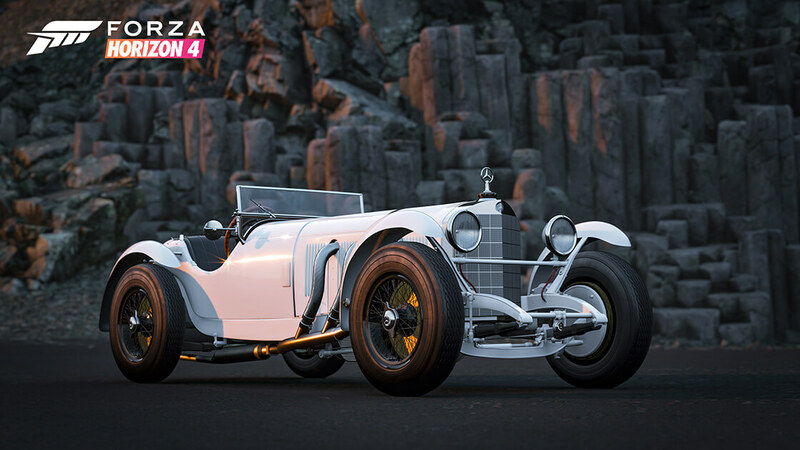 For those unaware, the Forza Horizon 4 Car Pass introduces two new cars every week for players to drive across beautiful, historic Britain – an initiative that lasts for a period of 21 weeks to deliver a total of 42 brand-new cars into the game. 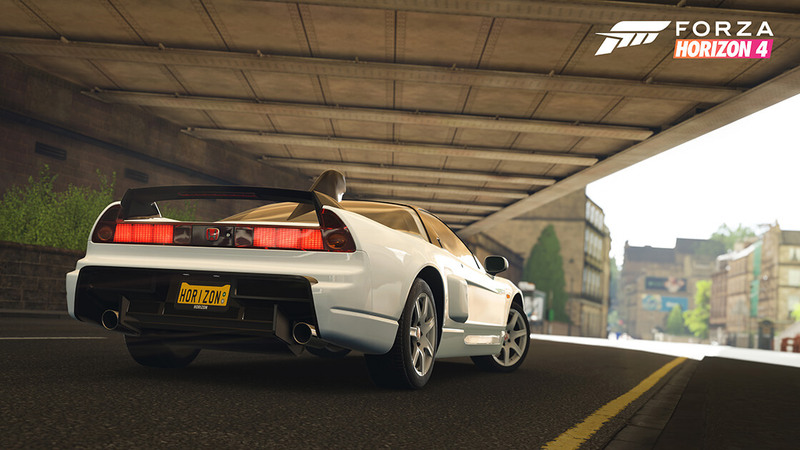 This week’s Car Pass additions include two wonders of automotive engineering, the first of which is a fan-favourite returning from past Forza titles – the 2005 Honda NSX-R GT, which is accompanied by a legendary motoring classic in the 1929 Mercedes-Benz Super Sport Kurz Barker Roadster. Both rides are ready and waiting to be collected, customized and raced alongside the British backdrop in Forza Horizon 4. Remember, these collection of automobiles are available to add to your in-game garage today at no additional cost if you own the Forza Horizon 4 Car Pass, included in both the Deluxe Edition and Ultimate Edition of the game. The Forza Horizon 4 Car Pass can also be acquired separately and is discounted for Xbox Game Pass subscribers. 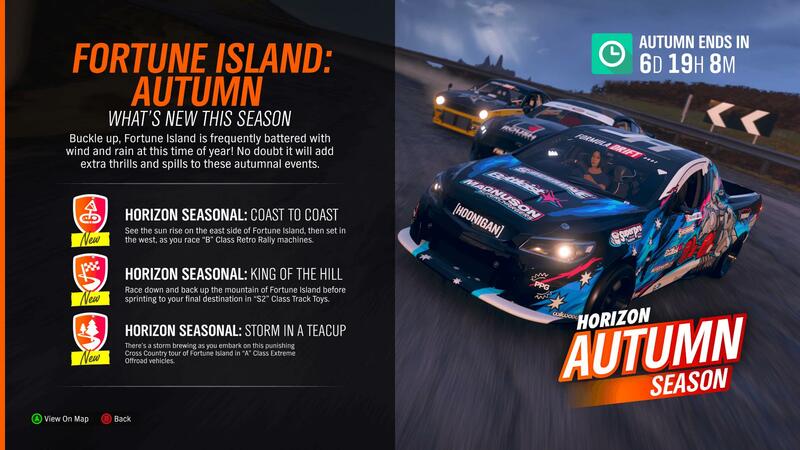 Experience the Autumn season this week in both Forza Horizon 4’s Britain and Fortune Island until Thursday, January 31st. This is when another seasonal change will occur in Forza Horizon 4 as we welcome the arrival of Winter and its slate of fresh events, challenges and cars. In the meantime, if you missed out on collecting the Autumn Barn Find, it’s available to acquire once again over the next seven days. This one can be found just south-east from the Horizon Festival, and should you successfully find it, you’ll be treated to a pure classic of British automotive engineering – the 1960 Aston Martin DB4 Zagato. Furthermore, you can also discover the new experiences featured in the Series 5 Update for Forza Horizon 4, which includes the return of Mitsubishi – as discussed above in relation to this week’s Forzathon challenge, and a new Horizon Story in Isha’s Taxis. There’s also the arrival of the solo-inspired ‘Free-for-All Adventure’ mode, as well as a host of smaller improvements and tweaks that result in an all-around better Forza Horizon 4 experience. Be sure to read our full breakdown of everything featured in the Series 5 Update for all the details you need to know. Forza Horizon 4 is available on Xbox One and Windows 10 PC, as well as the Xbox Game Pass subscription service. 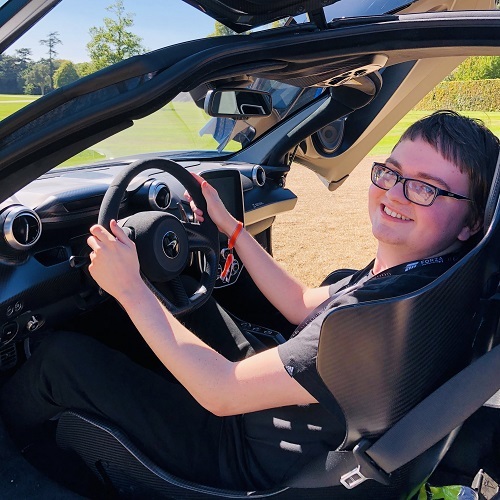 For more, check out our interviews with Creative Director Ralph Fulton and Xbox Games Marketing boss Aaron Greenberg, in which we discuss Forza Horizon 4’s extensive post-launch support and its incredible launch celebration event at the tranquil grounds of the prestigious Goodwood Estate in beautiful Britain. Haven’t played Forza Horizon 4 yet? Then be sure to hit up our in-depth review for everything you need to know on Playground’s unmissable shared open-world racing game, as well our detailed review for the Fortune Island expansion.